Polynesia incorporates a large number of islands that span, in the shape of a triangle, from New Zealand to Easter Island and north to Hawaii. As such, Polynesian cuisine is vast and varies from one place to another; however, one thing is for sure, each country prepares amazing pork. 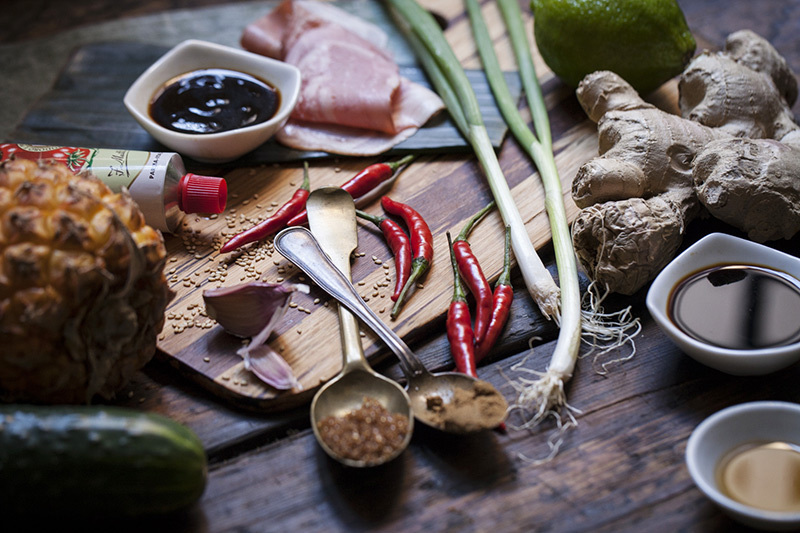 As this recipe and technique is inspired by the cooking of Polynesia, you’ll notice that I have incorporated staple polynesian ingredients as well as other ingredients more commonly found in Asia. What is most notably Polynesian about the pork I’ve created here is that it’s cooked inside banana leaves over medium heat for a long period of time. This is what I’m going to show you how to do here. Click on the image to view the whole recipe now. 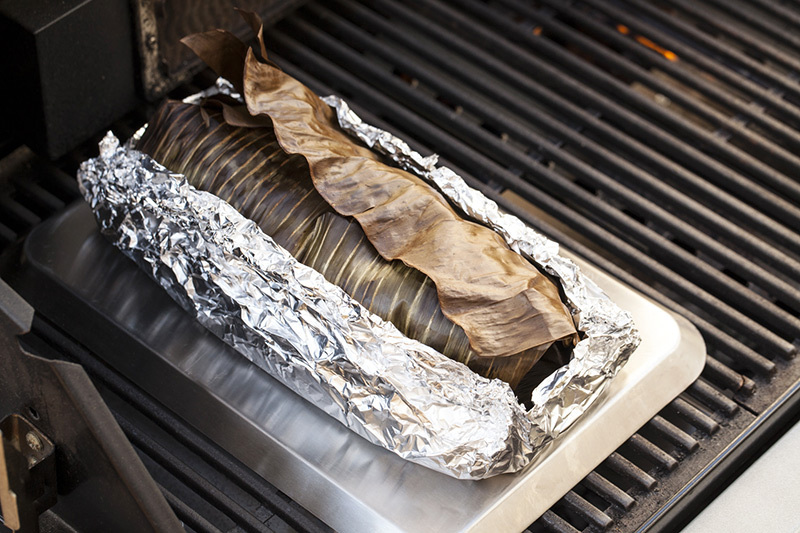 In Hawaii in particular, there’s a cooking method known as a Kalua that’s done in an underground oven called an Imu. The pit is dug out of the soil and then Kiawe (mesquite) wood is burned down to hot embers. Rocks are added and allowed to heat up to very high temperatures that will continue cooking the meat long after the flames have died down. Once the flames have dissipated, the rocks are lined with banana leaves and the meat is seasoned and wrapped tightly in banana and ti leaves. 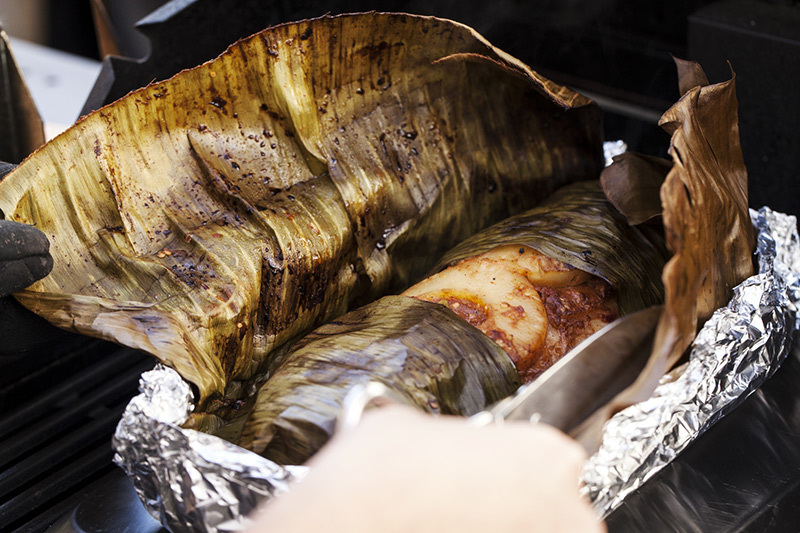 The leaf-wrapped meat is then placed on the banana leaf lining and then covered with a damp layer of burlap. It’s topped off with sand or soil and the meat is allowed to cook long and slow, in its own juices for hours on end. The end result is very juicy, tender and succulent meat. Let’s take a look! 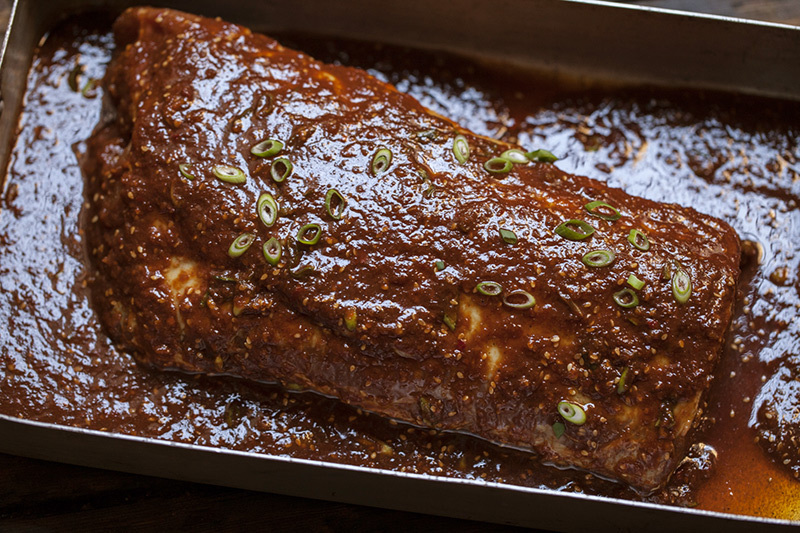 Begin by preparing the marinade and allowing the pork to marinate in it for at least 12 hours, overnight will suffice. Layering several banana leaves on a hard flat surface line them with bacon. This is where the traditional smokey flavour will come from. You can equally use a smoking box however, not much of the smoke will penetrate through the leaves. Use only enough bacon to cover the bottom of your roast. You can also try using liquid smoke for a more robust smokey flavour. 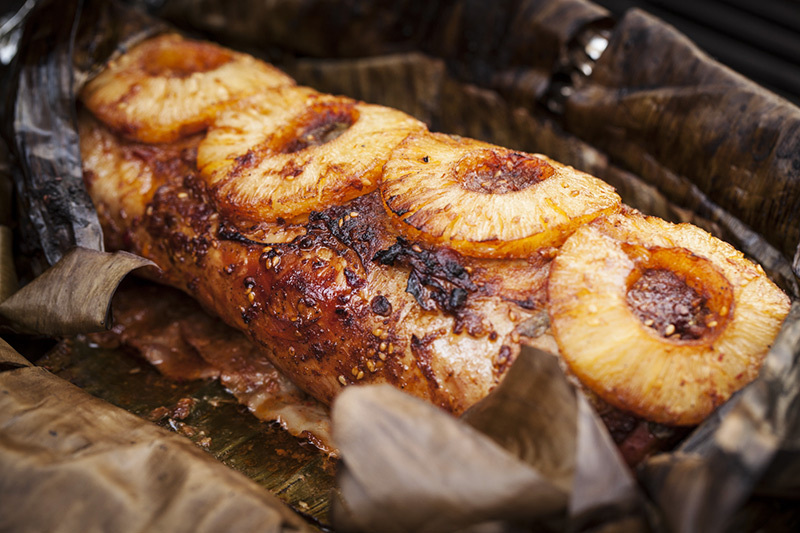 Once the meat is placed on the bacon and the leaves, place a line of sliced pineapple along the top of the roast. For the next step, you may need an extra set of hands. 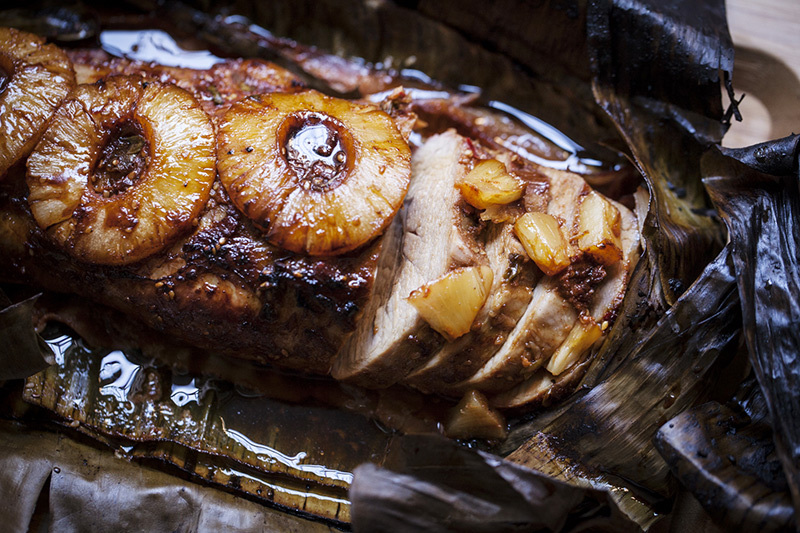 Making sure that the pineapple stays on the top of the roast, fold the banana leaves over the pork and ensure that it’s as tight as possible and that there aren’t any cracks or you’ll lose the precious juices. Then, using a heavy gauge aluminium foil, form a tight pocket around the leaves to keep them closed. Because we won’t be using burlap and sand to hold everything together, the foil helps to keep everything intact while it cooks. Turn on one side of the barbecue to medium-high and on the opposite side of the grill place a baking tray upside down with the roast on top. This will mimic the contact from the rocks that it would normally come into contact with in an Imu. (Don’t use a cast-iron hotplate for this exercise as it won’t get hot enough over indirect heat.) Close the hood of the barbie and let it cook over indirect medium-high heat for about 1 1/2 hours. Click here or on the image to view the BBQXL Stainless Steel Tray and Bamboo Chopping Board. Once the 1 1/2 hours have elapsed, expose the pork loin to allow the juices to concentrate and caramelise and for the outside of the meat to brown-off. Only leave the roast on long enough to allow the outside to crisp up slightly. If you leave it on too long unwrapped, you’ll end-up drying out the meat and spoiling the work you went to! 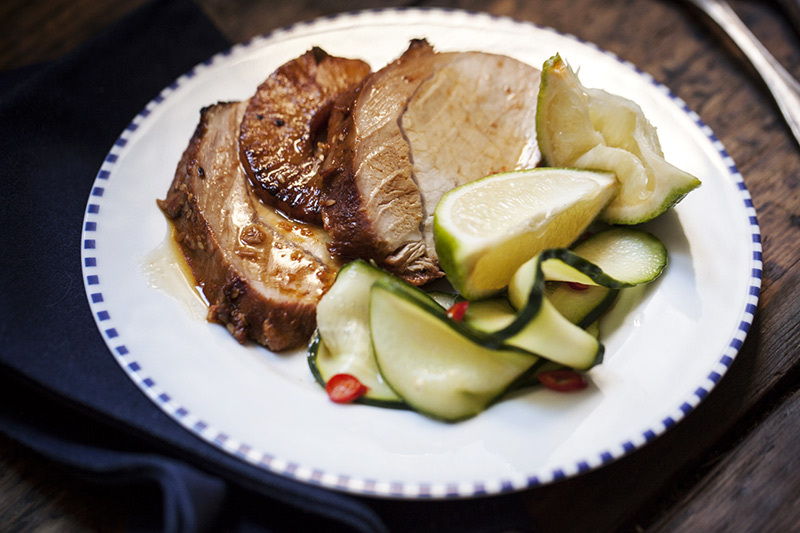 As a side dish to the pork, try simply slicing cucumber finely, and mixing it with equal parts water and white vinegar. Season only with a touch of sugar, salt and finely sliced Thai chillies. Serve the pork with the pineapple and a generous serving of the sauce and juices under the loin. 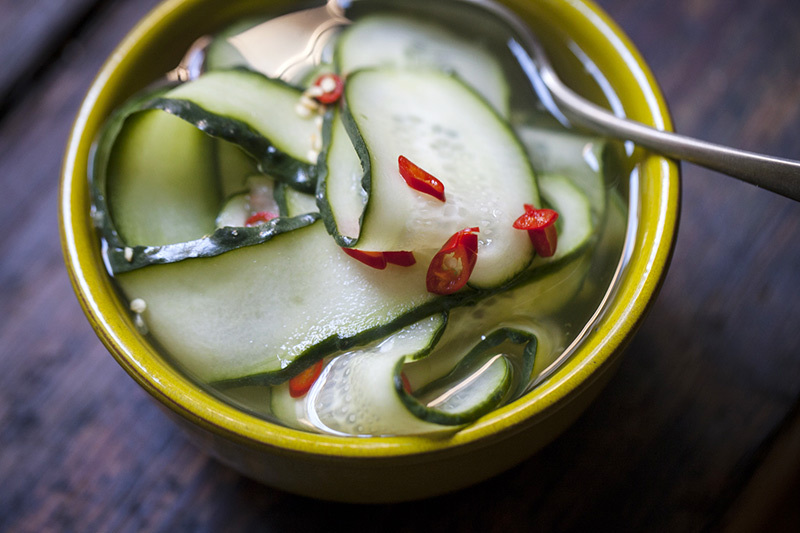 Accompany it with fresh lime wedges and the simple cucumber salad. Click on the image to view the whole recipe now. 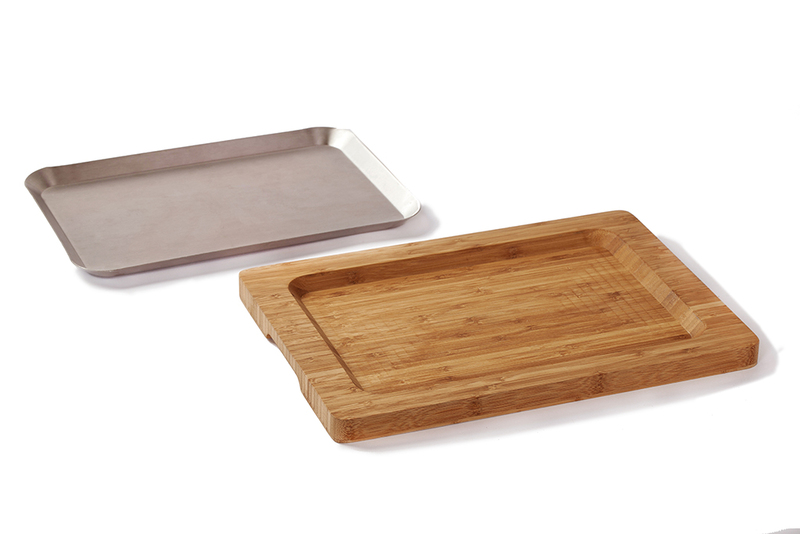 Click here or on the image to view the BBQXL Stainless Steel Tray and Bamboo Chopping Board.